ISO 9001 is the most widely accepted international standard for company-wide quality management systems (QMS). This certification is awarded to companies that prioritize constant improvement and delivery of exceptional products and services. The latest standard, ISO 9001:2015, emphasizes principles such as a strong customer focus, a process-centric approach to quality and continuous improvement. Conducted a series of internal audits and management reviews. Defined and documented all business processes and supporting work instructions. Identified key issues and required efforts stemming from a Quality Management System review. Passed external audit performed by Smithers Quality Assessments, an accredited quality and environmental management systems certification body. Provided proper education and training for all employees impacted by the ISO certification. According to Hynes Industries’ President and CEO Rick Organ, upgrading to the 2015 standard was a natural next step in the company’s long-standing focus on quality. 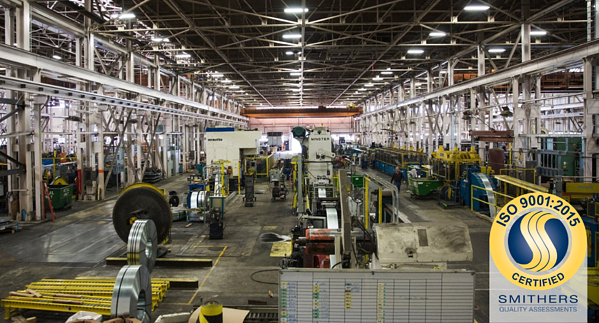 For more than 90 years, Hynes has provided innovative, customized metal solutions to its customers with a focus on product quality, customer service and delivery performance.